THE first ever Simply Speaking talk show saw the country’s ‘Golden boy’ share the most heartfelt life experiences as a musician and as a young man growing up in the Shiselweni region. 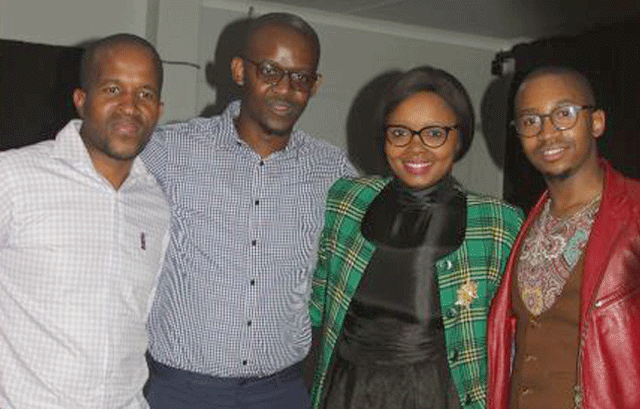 The monthly show saw its first installment on Wednesday at Liberty Centre in Manzini; hosted by Phila ‘P.h.D’ Dlamini and Lindokuhle ‘Leendor’ Mthupha, the show hosted it’s first guest singer and songwriter Sands. Sands shared with the crowd how he started off his career and how the industry has taught him a number of things including how to be content with his music. P.h.D asked Sands about his father and the atmosphere in the room changed. P.h.D asked how his relationship with his father was as he always talks about his grandparents and his mother, Sands shared with everyone who attended that his father was absent most of his life but they have since rekindled their relationship. “We are best friends now, we are very close compared to the old times and I understand that we all make mistakes and the best thing about it is that he is trying to make up for lost times and that is just the best,” said the singer. As the show went on Sands shared that his favourite stage to perform on is the MTN Bushfire stage because it has that ‘home’; effect. he also shared with the audience that his dream stages were the Cape Town Jazz Festival and any festival in the Netherlands. The crowd was also given a chance to ask the singer questions, Nozipho Simelane asked how he manages to stay sane after all the ‘craziness’ that happens when he is doing shows to which Sands answered, music is the only thing that keeps him calm. The elephant in the room was the singer’s relationship status to which he responded to the affirmative, stating that he actually is seeing someone, adding, it isn’t easy for him to be in a relationship especially because of too much travelling. Even though he did not share too many details about his significant other, Sands said he still tries to make it work. The ‘Tigi’ hit maker also shared that he has been working on his second album and even though he couldn’t share too many details about it, he did however, mention something about the record label Kingdom Tales, saying his initial idea before the music but God saw it fitting that the album be released first before the stable is fully established. Speaking to the audience after the show, Nozipho Simelane said she enjoyed and loved the concept of the entire show, “I loved it even though they were a few gaps in-between the answers but I enjoyed it,” she said. Speaking to Philani ‘Sgonia’ Mpanza one of the brains behind the show, he said he was really happy with the turnout of the show and looking forward to the next show, where they will be hosting a different guest.